Sign up to Chico's emails for a 20% discount on your next purchase plus enjoy exclusive discounts, announcements and invitations to special events. When you arrive on their site, click on the promotion at the top left where it says $25 off $100, then click on details and print, can be used online too. Print the whole page or show on your mobile phone, passport members take an extra 5% off. Spend $100 or more in Chico's boutiques and get $25 off. Spend $75 or more in Chico's Outlets and get $25 off. Present the coupon at the time of purchase in Chico's U.S. boutiques (excluding outlets). Get 20% off on your entire purchase. Print coupon to receive a 30% discount on your in-store purchases. Print out the whole email. 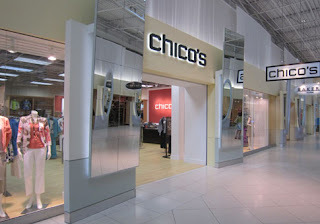 Get a 25% discount on full priced items at chico stores. Save 35% on full-priced styles when you present coupon to sales associate at time of purchase. Passport Members take an extra 5% off. Save 50% on your highest priced item when you spend $100+ in store. Friends & Family! Print and present page for a 25% discount on your entire in-store purchase.